For all Harry Potter fan fiction and fan art challenges, fests, exchanges, etc. - Weekly challenge posted at grangersnape100 (every Sunday). - Weekly prompt posted at snape100 (every Sunday). - Weekly prompt posted at dracoharry100 (every Sunday). - Weekly prompt posted at mixandmatch100 (every Sunday). - Weekly prompt posted at hp_hetgen (every Monday). - Biweekly prompt posted at draco100 (every other Monday) - check, I always get the week wrong lol! - Biweekly prompt posted at harry100 (every other Monday) - check, I always get the week wrong lol! - Submissions due for Lights, Camera, Drarry Fest at lcdrarry. - Submissions due for Snarry-A-Thon 2019 at snape_potter. - Prompting ends for HP Drizzle Fest 2019 at hp_drizzle. - Prompting begins for HP Het Minifest 2019 at hphet. - Biweekly prompt posted at hp_nextgen100 (every other Wednesday). - Due date for the weekly prompts at hp_humpdrabbles (every Saturday) and new weekly prompts posted! - Weekly prompt posted at snarry100 (every Thursday). - Prompt suggestion box closes for Dramione Couples Remix Round 10 at dramione_remix. - Claiming ends for HD Collab 2019 at hd_collab. - Due date for the weekly prompts at hogwarts365 (every Saturday) and new weekly prompts posted. - Posting for Ron/Draco Fest 2019 at ron_draco_fest. - Posting for Dracotops-Harry Fest 2019 at dracotops_harry. - Claiming for HP Shore of Angst at hp_shoreofangst. - Prompting for HP Shore of Angst at hp_shoreofangst. - April prompts at hp_bunintheoven, slythindor100, hd_fluff, poetic_hp, hp_coffeehouse, hp_creatures, and hp_unfaithful. If I have missed anything or made any errors, please PM potterfests_mod or theimpossiblegl, and corrections will be made ASAP. Please feel free to pimp your own fests or communities (or alert me when a new fest is coming) -- it's hard to keep up! Look at your old comms for activity, there are several under new management! About Tumblr - if your fest is only posting to Tumblr I am not pimping at this time. I'm SO angry about the change in TOS as this effects so many of the friends I have made over there (and maybe I have strikethrough PTSD), therefore I am no longer supporting their platform or participating in anything that has the potential to make them money. They jerk their knee, I jerk mine. Mod Update - Again, I'm sorry for the week skip. RL and the computers are not in a good place. Hooooo - look at all the fest activity on April Fool's Day! - Sign ups end for HD Collab 2019 at hd_collab. - Prompting begins for HP Drizzle Fest 2019 at hp_drizzle. - Prompting begins for Lights, Camera, Drarry Fest at lcdrarry. - Prompt suggestion box opens for Dramione Couples Remix Round 10 at dramione_remix. - Claiming begins for HD Collab 2019 at hd_collab. - Posting for HP Golden Age 2019 at hp_goldenage. - Posting for HP Bun in the Oven Fest at hp_bunintheoven. - Prompting for Lights, Camera, Drarry Fest at lcdrarry. Link: Prompting post is here. Type of challenge: Mini fest. Description: Any het couple in Harry Potter is welcome here, with the exception of underage couples. The timeline is short, with prompting open for two weeks, claiming open for two weeks immediately following that, then self-posting. Ratings restrictions: No rating restrictions. Description: "The Dramione Couples Remix Fest is a prompt-claiming fest for all the wonderful Dramione fans out there! The concept is simple. You choose from a list of famous couples throughout history, mythology, literature, folklore, legend, etc.You "remix" that couple's story–choosing whatever elements of the original story that inspires you–and create a brand new Dramione fic or piece of art!" - Last day to post March prompts at hp_bunintheoven, slythindor100, hd_fluff, poetic_hp, hp_coffeehouse, hp_creatures, and hp_unfaithful. - Posting begins for Dracotops-Harry Fest 2019 at dracotops_harry. - Sign-ups begin for HD Collab 2019 at hd_collab. Mod Update - I'm sorry for the week skips. My mac and dell have both had issues thanks to a huge tea spill (haha), but I should be back up and running. If you see any errors or a comm that needs updating dm me or leave a message here. - Posting begins for HP Get Lucky 2019 at hp_getlucky. - Submissions are due for Dracotops-Harry Fest 2019 at dracotops_harry. - Posting for HP Kinkfest Round 10 at hp_kinkfest. - March prompts at hp_bunintheoven, slythindor100, hd_fluff, poetic_hp, hp_coffeehouse, hp_creatures, and hp_unfaithful. Shore of Angst - Claiming going on! - Sign-ups and prompt claiming for Dracotops-Harry Fest 2019 at dracotops_harry. - Prompting for SSHG Promptfest 2019 at sshg_promptfest. Description: required pairing is Harry/Draco; this year's theme is Film Inspiration; all manner of teams are accepted: two writers, three artists, a podficcer and a writer, an artist and a writer, etc. - Posting begins for HP Kinkfest Round 10 at hp_kinkfest. - Last day to prompt for Glompfest 2019 at serpentinelion. - Last day to prompt for HP Shore of Angst at hp_shoreofangst. - Prompting and claiming ends for Riddikulus Fest at riddikulus_fest. - Last call for February prompts at hp_bunintheoven, slythindor100, hd_fluff, poetic_hp, hp_coffeehouse, hp_creatures, and hp_unfaithful. - Posting begins for Ron/Draco Fest 2019 at ron_draco_fest. - Prompting begins for SSHG Promptfest 2019 at sshg_promptfest. - Claiming for HP Bun in the Oven Fest at hp_bunintheoven. - Claiming for HP Get Lucky 2019 at hp_getlucky. - Signups and prompt claiming for HP Golden Age 2019 at hp_goldenage. Description: "The SSHG Prompt Fest/sshg_promptfest is an anonymous, prompt-based fest that explores the relationship between Severus Snape and Hermione Granger with a showcase of new, stand-alone fan works. You're welcome to participate in the fest if you're 18 or older, which you can verify by joining and watching the community, or by emailing your prompt-offering and/or prompt-claiming template(s) to the mod account. Once you've verified your age, you'll be able to offer prompts to the community, claim prompts from the community, and produce SS/HG (het) and SS & HG (gen) fan works of any rating for the community and its followers." 4 DAYS OF PROMPTING LEFT!!! 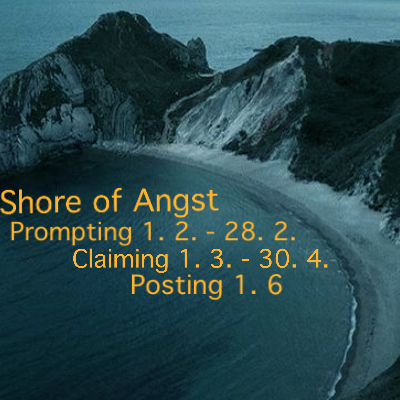 Shore of Angst needs your prompts to be able to run a round 4 ! Promo- Banners can be picked up here: @dw or here @lj --> both links go to my personal journal where i posted the promo banners, and FINALLY all the coding should be fixed! - Assignments sent out for Femmefest 2019 at femmefest. - Last day to submit prompts for Snarry-A-Thon 2019 at snape_potter. - Claiming ends for Ron/Draco Fest 2019 at ron_draco_fest. - Submissions due for Ron/Draco Fest 2019 at ron_draco_fest. - Prompting opens for Glompfest 2019 at serpentinelion. - Claiming for HP Kinkfest Round 10 at hp_kinkfest. - February prompts at hp_bunintheoven, slythindor100, hd_fluff, poetic_hp, hp_coffeehouse, hp_creatures, and hp_unfaithful. Description: Submit Severus/Harry prompts, then claim them to create fanworks. You do not have to claim in order to prompt. Each prompt may be claimed up to 4 times. When can I start? : As soon as the mods have confirmed your prompt. Creations are due: April 15. Description: "The H/D Glompfest (hosted at serpentinelion) was created so H/D writers and artists could show their appreciation directly to the people who make posting their creations so worthwhile. Without our supporters, who would we write and draw for?" - Last day to sign-up for Femmefest 2019 at femmefest. - Claiming for Ron/Draco Fest 2019 at ron_draco_fest. HP-Shore of Angst is taking Prompts now! - Biweekly prompt posted at draco100 (every other Monday). - Biweekly prompt posted at harry100 (every other Monday). - Prompting ends for HP Get Lucky 2019 at hp_getlucky. - The reveal for Snape Case 2019 at snapecase. - January prompts end at hp_bunintheoven, slythindor100, hd_fluff, poetic_hp, hp_coffeehouse, hp_creatures, and hp_unfaithful. - Sign-ups for Femmefest 2019 at femmefest. Potterverse Challenges, Fests, Exchanges, etc.